Tech wrestling, sigh. It can break the smartest of folks. Not unusually, I was feeling pretty stupid about a recent ‘save your damn draft’ cage match on another blogging platform. It left me wanting for merriment and good cheer. That led to thoughts of (DROWN YOUR SORROWS IN) alcohol – specifically, beer – but I didn’t actually do so. Some grown-up characteristic decided to exercise its right to self-care. Bet my endocrine system was rejoicing over that one. The next best thing seemed to be flipping through copies and reviews of drink-themed zines. This was during International Zine Month (July) where I was busily reading, writing and just admiring anything and everything ‘zine’ (being a non-maker). Oh yeah, didn’t I once write about a few beer and food-obsession/curation zines? Eons ago? Indeed! 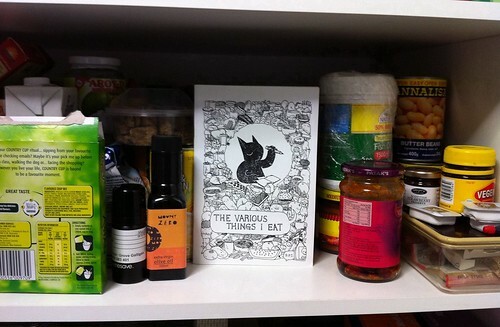 This entry was posted in meta om-nom-nom and tagged beer zines, food zines, International Zine Month 2014, macarons, Macarons Are Not Macaroons, Melbourne, self-publishing, Stubby Buddy, The Various Things I Eat zine, zine review on September 5, 2014 by gem. I’m sure all you hip cats are familiar with the Feltron reports, these amazing records of beauty that makes Percy Grainger look sane. Grainger was an obsessive saver and chronicler of his life (it’s myth but the rumour that his cancerous balls preserved in formalin exist somewhere in the Grainger Museum on the Parkville Campus of Melbourne University – dream large guys!). As part of one compulsory musicology subject I took, it required working at the Grainger Museum and doing some Grainger-related research. One afternoon, I was present when a fifty-year old archive box was emptied out. A small object was wrapped in tissue paper and very carefully unwrapped. It turned out be a fifty-year-old piece of chocolate bitten into by Grainger’s mother. You could see her teethmarks. Macabre and yet fascinating. So Feltron ain’t got nothing on him, though we all too can keep similar such statistics by using Daytum. I use Daytum like a mofo but only have displays of things like what I read for public show. 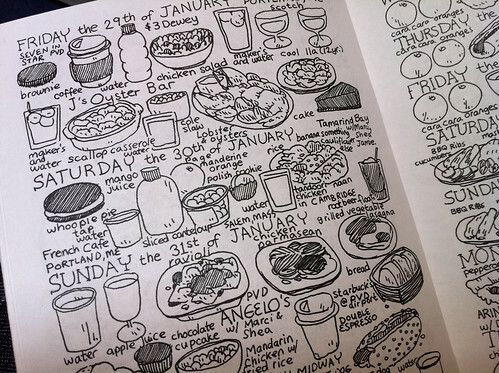 The following zinester, Deth P. Sun of Berkeley, CA has made a zine that to me was what I imagine an analogue Feltron report to look like – it is an obsessive document from September 2009 to February 2010 chronicling what the author has eaten in illustrated form. Both obsessive, a little unsettling and inspiring an odd sort of protectiveness for someone I don’t know and will never ever meet. In some sort of solidarity, I thought it’d be fun to post partial contents of the pantry of the place I currently call home. Getting a glimpse into a bad cookie-foodie’s pantry is a bit…confessional. Try not to judge me…too harshly. So is the zine any good? Yes! The illustrations while candid are adorable and carefully drawn and it’s pretty text-sparse given it’s a visual record. See below for an example of a page that typically outlines the author’s consumption which begs some assumptions and questions – he does not really eat that much, or dine out a lot. It makes me wonder just how much this reveals about the author – is he not affluent or struggles financially? Is he not fond of dining out? Does he (and this is uttered in genuine concern) have issues with eating and perhaps not eat as much as he should? 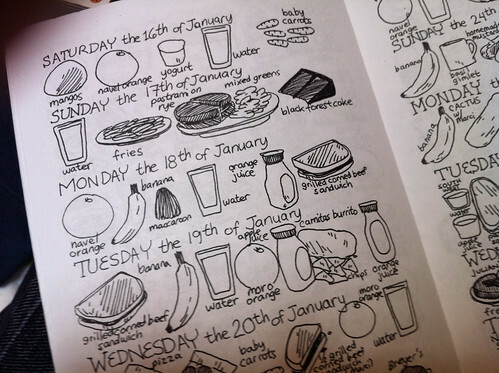 It’s a bit of a different story when he’s on what looks to be holidays and I confess I am relieved to see a lot more entries for the days on the following page. An utterly charming zine, purchased at zine Mecca Sticky Institute in the Degraves St subway (conveniently located across from Cup of Truth, mmm…). I did buy it a while back for $4 so it might not be around anymore but I highly recommend it if you can find it. It’s a really meticulous, intimate snapshot into an artist’s life and particularly commendable is the zinester really putting themselves out there for intense scrutiny. That often makes for the best art, would you not agree? 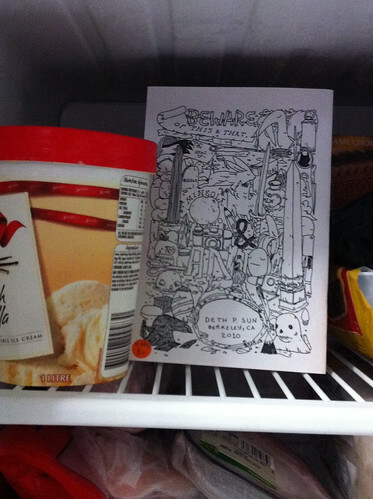 This entry was posted in cookie-foodie antics and tagged daily consumption habits, Daytum, Deth P. Sun, Feltron report, food zine, Percy Grainger, Sticky Institute, The Various Things I Eat zine, visual diary, zine review on June 9, 2011 by gem.